Any wild animal has the potential to cause damage to human property, but the ones that live in densely-populated areas can be particularly troublesome. Raccoons are highly intelligent compared to most other types of pesky varmints that homeowners encounter, which makes handling them more difficult. Raccoons are omnivores and will eat just about anything. One of the most common issues with raccoons occurs when they break into trash bins and garbage cans, leaving huge messes when they dig for food. Raccoons will also invade human properties if they smell domestic pet food. Homeowners that feed their dogs and cats outdoors are more likely to see an unfamiliar, masked face looking up from the food bowl! Their intelligence isn’t limited to stealing food from human dwellings. Raccoons are smart enough to open discarded food jars, and unlatch sheds and doors. They sometimes grow bold and break into houses they think may contain food. Raccoons are agile climbers and can scale a house or building with ease. They have strong limbs, and some will rip holes directly into roofs, ceilings, walls, and air ducts. Raccoons can cause enormous problems for air flow in homes, as they tear up air ducts and can squash them to the point of restricting air flow, tear out insulation, and destroy pipes. Raccoons may also damage wiring and other fixtures, such as clothing lines, birdfeeders, screen doors, and pet enclosures. Critter Control in Dallas has a team of expertly-trained technicians that have experience in trapping and relocating raccoons as well as handling raccoon damage. We can provide assistance in assessing any damage they caused, and if they managed to infiltrate your home or attic, we can get them out and discover where they gained access. 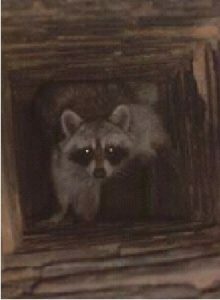 If you’re having issues with raccoons, Contact Us or give Critter Control in Dallas a call to start solving your problem.